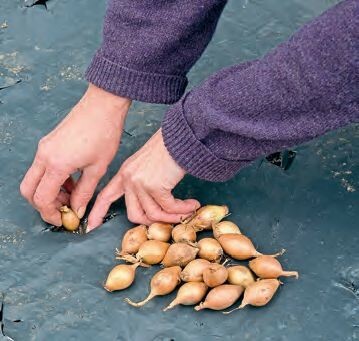 STEP 1: Small sets are the easiest way to grow onions. 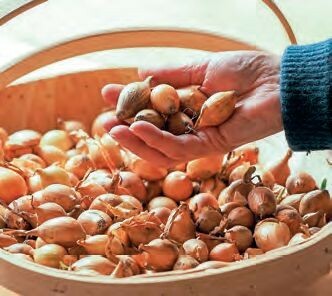 These part-formed bulbs should be disease-free and all ready to grow when planted. White varieties often grow larger bulbs than red ones. Choose sets that are firm and haven’t started to sprout – plants from large sets are more likely to bolt and tiny ones take too long to get growing. Discard any that show signs of mould. 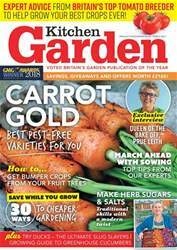 STEP 2: Dig compost or well-rotted manure into the bed and firm the soil before planting. You can tread on the bed provided soil isn’t wet and sticky. Rake some wood ash or powdered seaweed into the surface, to provide potash. Add a scatter of lime to acid soils and then either plant direct or through holes cut in a mulch of weighted down black plastic. Soil must be kept moist underneath.